The US was leading the rest of the world through September 2018, but a couple of regions outperformed the US in October 2018. For the year-to-date through October, the US has been the best performing stock market. Growth stocks have been out of favor outside the US but in favor within the US. Yesterday I released this article on performance of the US stock market in October and the year to date. This commentary expands the analysis to cover the rest of the world, as shown in the following graph. The US led the world and every country through September 2018, earning 10% versus the 1% loss in the rest of the world. In October, two regions outperformed the US’s 7% loss. Latin America earned a positive 0.5% return and Emerging Markets lost 4%. As a whole, foreign markets lost about the same as the US in October. 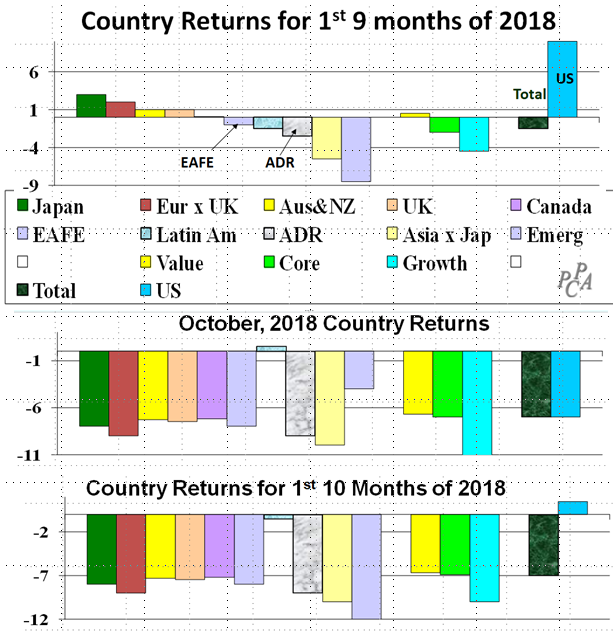 Updating through the 10 months ending October, the US 3% return outshines every country and the foreign market as a whole, which has lost 7%. Unlike the US where growth stocks have been in favor, growth stocks have been out of favor in the rest of the world.